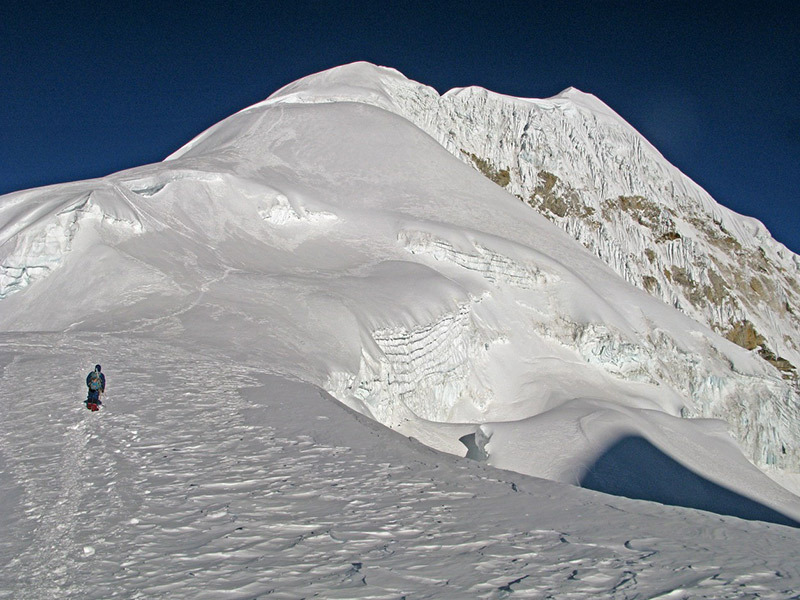 Island peak is one of the most popular peaks in Nepal due to its accessibility and the location. 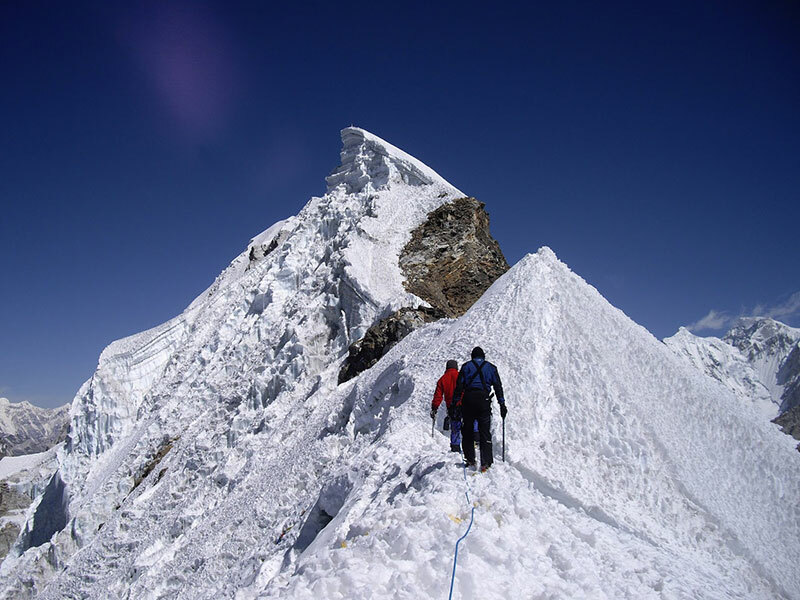 It is popular among both advanced climbers as well as novice climbers because although physically demanding, the peak climb itself is less technical. At the elevation of 6189, Island Peak offers one of the best views of the Himalayan range including Everest, Lhotse, Nuptse, Amadablam and many other 8000M peaks in the region. An easy walk today through Monjo will take you through the pine trees and glimpses of distant snow capped peaks. You will encounter few impressive waterfalls and yaks along the way taking necessary foods and other essentials for the trekkers as well as the locals. You will pass through the checkpoint before reaching Monjo where the officials check your permits. All trekkers to this region require TIMS cards and National Park Entry Fee. Your guide will sort out the paper works while you can stroll around for a bit. After this you officially enter the Sagarmatha National Park and a little way up the trail, you will arrive in Monjo where you will stop for lunch. After Lunch, you start your trek through the wooded valley on a good trail crossing the river through high suspension bridge. Right after the bridge is the upward climb towards Namche. An hour and half long ascent to Namche is famous among the locals as “Namche Ko Ukalo” meaning the uphill of Namche. Its all uphill till you reach Namche, and about an hour before reaching Namche your hard work will be rewarded by your first view of Everest. Your guide will walk you to the lodge you will be staying overnight. Today we will ascend towards the biggest monastery of the Everest region located at Tengboche. It encloses within Sagarmatha National Park which is listed in a UNESCO world heritage site. The trek to Phunki will be easy, but soon the ascending will start becoming challenging. The panoramic view of the Himalayas from the monastery shows us a divine universe built under the same range. We can observe a Buddhist religious ceremony. With a magnificent view of a rhododendron forest followed by a bridge over the raging Imja khola (River), we ascend towards Pheriche which is a nice valley with Sherpa settlement in the region. This can be a great opportunity to have a lunch with the Sherpa locals and talk about their life in the Himalayas. Kalapattar’s altitude is often given as 5550m but the hill, further along, is a little bit higher. 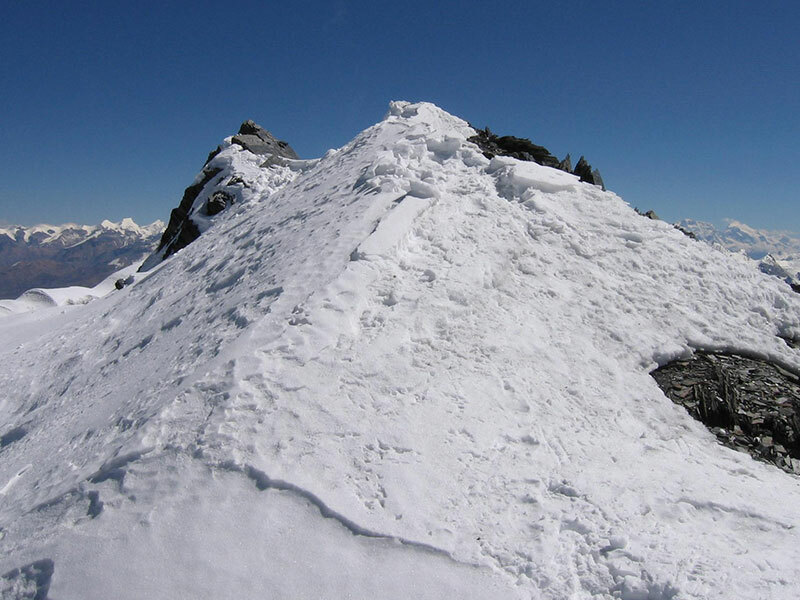 One fact is that you do not see the top of Kalapattar from Gorakshepe, only a false summit which is much lower. It is a fairly tiring walk up there unless you are well acclimatized. The views from the summit are memorable. Everest views are the best you can get from this place. Descent from Kalapattar is easy, just a quick straight down walk. We have our breakfast here and trek back to Lobuche the same route we came up. 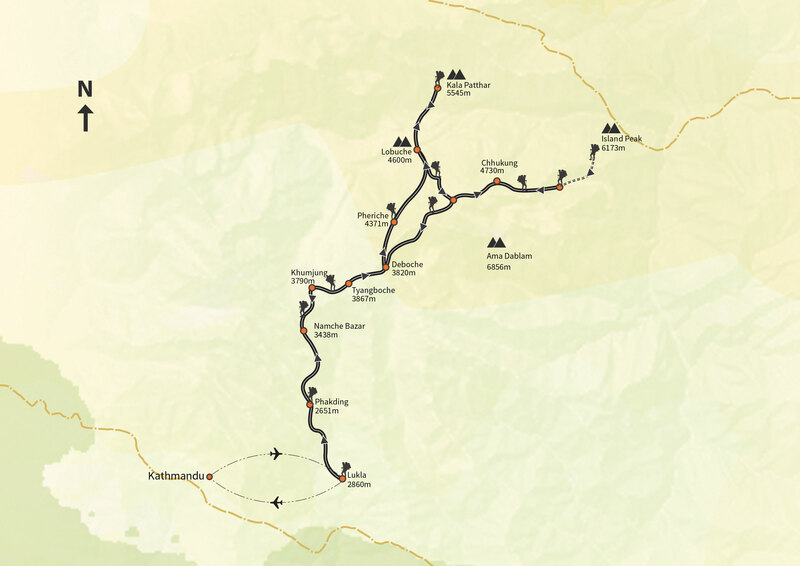 We trek to Chukkung today taking the same route we took while coming up following Dugla and then onwards via Dingboche. An alternate route to Chukkung is also available that goes through the Kongma La pass which can be considered as the most strenuous part of the trek. Upon reaching Chukkung, a small settlements where we check our equipments before heading out to the base camp tomorrow. Following the fairly steep route towards the base camp, we move south as we walk towards the winding paths below the Lhotse glacier. Arriving at the base camp, our crew will set up the tents which will give us enough time to observe the surrounding. We will take a quite training on the climbing before heading for the big climb tomorrow. A very early morning start today at around 1 AM in the morning will start after quick breakfast. The wind during the afternoon is strong which can hamper the summit push so we start early today. Climbing the steep hill, the trail narrows. Although not very difficult climb, we need to watch out for the rocky steps as we climb. Our guide will take care with the rope fixing with both main rope and fix ropes. The summit will be one experience that you will cherish with views of the panoramic Himalayas spread across beautifully. We head back towards base camp and then toward Chukkung. We retrace our back towards Tengboche, a small village on top of the hill with ancient monastery overlooking Thamserku. Back to Tengboche from where we continue retracing towards Namche. We will be reaching Namche approximately in the late afternoon. You are free today in Kathmandu that you deserve very much after the strenuous trek and the summit. Evening, we will be transferred to a fine restaurant “Le Sherpa” for dinner.